Hamelin Bay, just North of Augusta is an easy 3 1/2 hour trip (310 kms) from Perth. It will be difficult to describe this trip in just a few paragraphs but there were some highlights too good not to share! Our beautiful South West has so much to offer and I couldn’t think of a better way to go exploring than on a SUP with a convoy of really cool people! 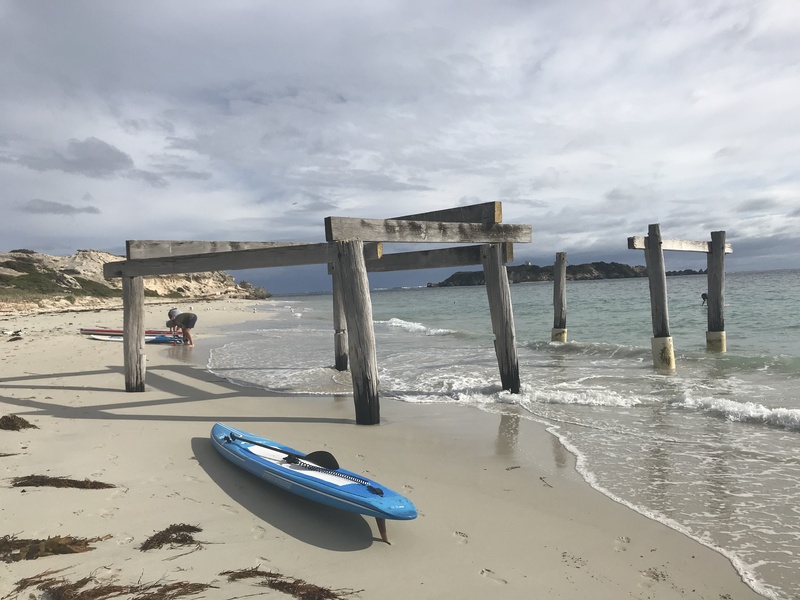 Hamelin Bay is not without some interesting attractions and history including the notorious shipwrecks, the iconic remains of the Hamelin Bay Jetty and the devastating whale strandings that occurred on the exact same day 9 years apart. If you’re visiting in the warmer months you’ll have the company of wild friendly stingrays and if the weather is just too unfriendly for supping there’s always the nearby caves to explore…seriously amazing, albeit touristy but well worth it. No sooner had we checked in, we all made a 200 meter dash with boards straight to the water and paddled a short distance over to Hamelin Island where we soon had the company of some friendly dolphins. It’s always a privilege to see dolphins no matter how often we encounter them however nothing could have prepared us for the close encounter a few days later with a humpback whale in Flinders Bay, Augusta. Whilst paddling at Seine Bay (Hardy Inlet) we made a spontaneous decision to walk our boards over the sand bar to the ocean. It was too tempting not to have a quick paddle around as the water was so inviting. Not too far away we saw the blowholes and then the shape of a very large barnicled humpback, just a few hundred meters in front of us. With a reasonably strong offshore wind developing we were drifting fast towards the whale. It was exciting but strangely enough the preference to give the beautiful beast some space overcame our desire to indulge in our curiosity. Tim and Craig did make eye contact…she wasn’t concerned but it was time to head back to the beach and digest it all from a respectful distance. I want to experience this again and there is something profound about the unexpected so I don’t think I’ll be booking a whale sight-seeing trip anytime soon but either way it’s an experience of a life time. Whilst it’s hard to beat an encounter with a whale there was more to enjoy. A fun paddle along the blackwood river from Alexandra Bridge – glassy one minute, raining the next but gloriously picturesque. Likewise was the paddle around Molloy Island on our last day where we managed to jag a window of good paddling in between some stormy conditions that raged all through the night and well into our last morning. Another special moment that put lumps in our throats and attracted a gathering crowd was the sound of bagpipes being played at dusk in the bay. That moment will stay in our hearts for a long time and it was a beautiful highlight of our trip. Check out the YouTube links of our road trip buddy Kevin playing the pipes and of our weekend that captures the spirit of an amazing time spent with friends. Our love of stand up paddle boarding has opened up a whole new world of mini adventures and I’m lucky to have shared this trip with some incredible people. We had a fabulous four days of convoy road tripping! Exploring, sharing meals, stories and banter. The energy, the vibe, the wild weather. It was all perfect. Road trip # 6 is now in the planning stages!